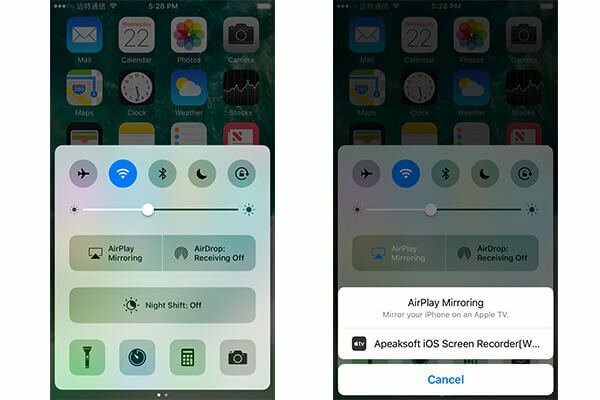 Apeaksoft iOS Screen Recorder can mirror the iPhone, iPad or iPod screen wirelessly on the computer, then you can record gameplay, videos and other live content without any hassle. Besides, it supports iOS devices running iOS 7.1 to iOS 11. It supports most iOS devices, including X/8/8 Plus/7 /7 Plus iPad Pro, iPad mini 4, iPod touch, etc. And it allows you to preview your lost data before recovery.Key Functions:1.Apeaksoft Screen Recorder has the capacity to mirror your iPhone iPad or iPod content in real time with no lag.2. You can easily record on-screen live content from iPhone iPad or iPod on your PC, like videos, gameplay, audio etc.3. You are able to one-click recorder the screen of your iPhone iPad or iPod on computer.4. The program can output HD video in MP4 after the recording, and then you can share it based on your need.5. You are able to customize the recording settings according your your needs.6. Screen Recorder fully supports with all models of iPhone, iPad and iPod touch.7. You are also able to use a projector and share your device\'s screen to people with the help of iOS Screen Recorder. You can use the program for business purpose at work as well, and use real-time mirroring to showcase products and create demonstrations.